The COBB Stainless Steel turbo-back Exhaust checks all the boxes in what you're looking for in your Fiesta ST. From the turbo to the tailpipe, this system was designed and fabricated with the driver in mind. 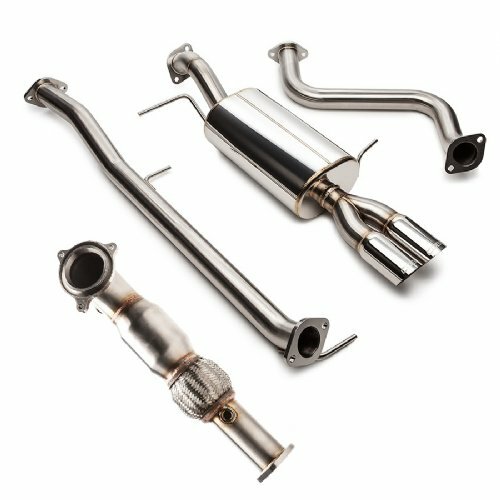 The high flow catalytic converter, muffler section and dual laser etched tips offer optimal performance gains, tasteful looks and unparalleled durability all while maintaining an exciting but livable exhaust tone. Constructed as a direct fit replacement for the stock unit, this system requires no modifications or "tweaking" of the exhaust components. Simply bolt the system on and enjoy the power, looks and sound of this impressive exhaust system. The COBB Stainless Steel Catted Downpipe for the 2014 Ford Fiesta ST is a direct replacement unit which features full 304 stainless steel construction, billet machined turbo flange and a high quality metal spun catalytic converter. All of these features combine into an excellent replacement for the power robbing factory unit!